Living on Our Boat: One Year in! You guys. Garrett and I have lived on our 35’ sailboat for one whole year and are still here to tell the tale. If that isn’t an accomplishment, I don’t know what is. In all seriousness, though, it’s been an adventure. There have been ups and downs. Garrett loves living on the boat; I like it. I don’t regret our decision. There are comforts of an apartment that I miss, and benefits of living on the water that we didn’t foresee. We’ve been able to save money and still travel a lot. We’ve made new friends. The rainy winter has been hard. I’ve been inspired to tap into new areas of creativity. Garrett has become more domestic. I’ve become more disorganized. Garrett is a much better sailor than he was a year ago. I have incrementally improved. I’ve been trying to be as authentic as possible in this journey of ours. I don’t want to glorify it, but I don’t want to bash it, either. Sometimes I love living on a sailboat, and sometimes it makes me cry. And now that we have a full year of liveaboard life under our belts, I wanted to share the good and the bad of this adventurous life we’re leading. I’ve talked about this before, but the amount of money we’re saving almost makes living on a sailboat entirely worth it. We’re a dual-income household making Bay Area salaries without having to pay Bay Area rent. I will also admit that our spending hasn’t really slowed down—we’re traveling a ton, buying goods and clothes when necessary (or wanted), and of course investing in the boat—but we are still able to pocket savings money every month, which we struggled to do when we lived in our San Francisco apartment. The unforeseen benefit to living on our sailboat that I mentioned above? The nature! It’s really incredible to wake up to the sun rising over the water or harbor seals huffing and puffing right below our boat. We love the marina birds — the great blue heron, the egrets, and the night herons are our favorites; and we’ve seen other beautiful species come through on their migration paths this winter. Living on the water creates an idyllic, peaceful environment to wake up to and go to bed in. That is, when we’re home. Because these days, it feels like we’re more often away from home than not. Since moving onto our sailboat a year ago, we’ve traveled to Palm Springs, Chicago, New York, Detroit, Rhode Island, New Hampshire, Ireland, England, Portugal, Mexico, France, LA, Tahoe, Florida, South Carolina…I’m probably leaving off a few. But the point is, we travel a lot. Sometimes for work, most times for fun. We’re gone so much that it stopped making sense for us to pay $2,500 a month to rent an apartment that we were never in. And, now that our costs of living are lower, we have more budget to travel, which is a major win in my book. When we are home, we both really like living in Sausalito. It’s nice to be living outside of the city—even though we’re still in San Francisco all of the time. There’s a sort of ease that comes with living in a suburban community: I don’t drive around in circles looking for parking anymore, I don’t have to worry (as much) about my car getting broken into, it’s less crowded, and we’re faced less with the homeless and mental illness issues that line the streets of San Francisco. Sausalito isn’t perfect—it’s quite eclectic, actually, and just the right amount of weird for us. We also have such a good time hosting people on the boat. I mean, who doesn’t want to go sailing on a beautiful Saturday afternoon? It’s really fun for us to have an activity to do with friends—new and old—pretty much all of the time. 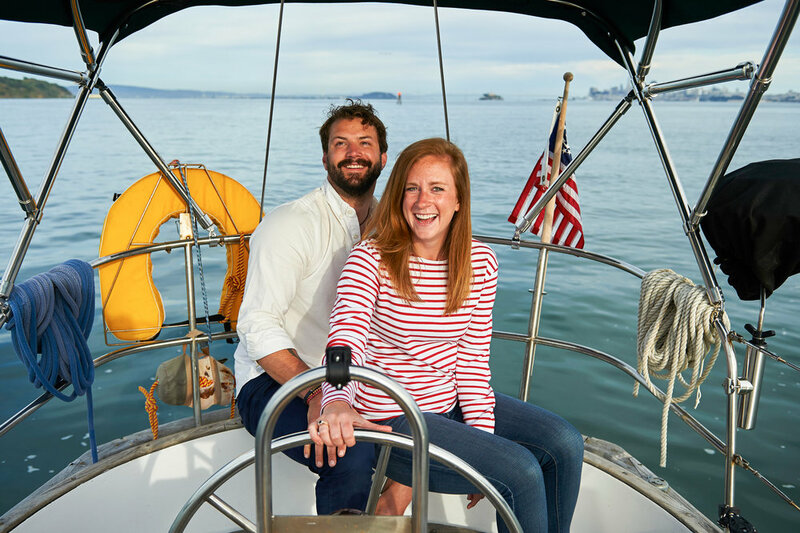 Whether we’re going out for a quick spin, spending the night at Angel Island (my favorite), or just enjoying cocktails in the cockpit, our sailboat is always a good place for a good time. On top of enjoying Sausalito, we do enjoy our tiny floating home. I think that our sailboat is the embodiment of Hygge. I love the way that the sunlight filters through the portholes in the morning, and that I can stare out at the water while I’m chopping vegetables for dinner. I like how the water rocks us gently back and forth. I like that it’s easy to temperature control: being in the water keeps the boat cool when it gets hot outside and we have a space heater that warms up our small living quarters easily when it gets cold. Our sailboat is always comfortable and, as a result, comforting. Last but not least, Garrett is so happy to be living on our boat, and seeing his joy makes me happy. He wakes up like a kid on Christmas morning every day. I know that he wishes I loved living on the boat as much as he does, and sometimes that wears on both of us. I’m enjoying this chapter in our lives and wouldn’t be doing it if I didn’t want to. But is living on a sailboat my end all? No. I think it could be for Garrett, though. He loves it so much. Regardless, I’ll always look back at this time in our lives with happiness. The stormy winter really took a toll on the both of us. One of our favorite things about living on the boat was our ability to easily enjoy the outdoors. It’s been a cold, wet, and windy few months, which means we’ve been spending most of our time cooped up below deck. This isn’t too different from how we’d be spending our time in an apartment during the winter, but we definitely feel the weather more on the boat. The wind tosses us around and makes things clank in the night. The rain has been so prolific that our historically non-leaky boat has taken on so much water that it started to leak—right over my side of the bed. That has been unpleasant. On top of feeling cooped up, I miss having a private bathroom. We have a head on the boat with a toilet and sink but no shower. I’m getting tired of showering at the gym, of always carrying my toiletries and the next day’s outfit in my backpack. I covet the thought of having my own full bathroom one day, with my own things in the cabinet and shower that get to stay in the cabinet and shower. Another downfall to living on the boat is that I have less control over my diet because we don’t have a fridge. This is only really an issue for the weekends and evenings, because Garrett and I are lucky to have catered lunches and snacks at work. The biggest issue for me in not having a fridge is that we can’t store perishable food or leftovers, making it hard to store groceries and leftovers. There is a small market right down the road from us, which is convenient but expensive. The other nearby grocery stores are always gridlocked in traffic after work, so we never go there to shop. We eat out a lot. I miss cooking. I’ve gained some weight. It’s still something we’re figuring out—and hopefully remedying soon by installing a refrigeration unit. I’m not sure if this is a condition of my always-on-the-go lifestyle or living on a sailboat, but I’ve actually become less organized since moving on board. I believe a major contributor to this is the fact that we keep our belongings on our boat, in our storage unit, and in a car. My things live between so many places that I find it hard to keep track of what is where. It’s also really easy to make our space messy. That’s just a circumstance of living in any small space, I think. And when you have two people living in a small space? It’s just more opportunity for mess. Top that with the fact that when you have to get to something on a boat, you usually have to take something apart, and well…our environment can often feel more taken apart than put together. However, I will say that for as easy it is to get messy, it’s just as easy—and quick—to clean up. If I’m being totally honest, it’s been a little hard for me to go back and forth between this semi-adventurous lifestyle of living on a boat and traveling constantly to my regular day-to-day working life. There’s a disconnect somewhere. I haven’t quite felt like myself in months; part of that comes from having the winter blues, but I think another part comes from switching gears so drastically every day. I’m paying attention of this and am trying to incorporate habits that make me feel better: establishing a routine, exercising, eating well, drinking less, sleeping more. These are all things that are in my control, and not the boat’s, so I’m working on getting back on track with myself and will check back into how I feel that the boat is affecting me again soon. I am hopeful that the springtime will bring more sunlight and more dry weather so we can get back to what we love to do most with the boat: be outside. Host our friends. Go sailing. So what have we learned in this first year of living on a boat? Well for one, that we can do it. Garrett and I are pretty good at acclimating to new environments, and this “tiny home” type of living situation has been no different. It’s been really interesting to watch how our domestic roles have shifted, though; Garrett definitely cleans and tidies up the boat more than he ever did any apartment, and because he’s stepped up in this role, I’ve stepped down. A little. I was pretty quick to recognize that I like my creature comforts and needed to bring certain things onto our boat to make it feel like a home, like candles, fresh flowers, my favorite fluffy blanket. We definitely have a lot less stuff and are pretty good about keeping our boat sail-ready, but having a few possessions around that make me happy in our space has really made a difference in turning our boat into a home. We’ve also learn to shrug off the opinions and thoughts of others. When we first moved on board, we were worried that people would see us as derelicts. For the most part, that hasn’t been the case at all; I’ve actually been surprised at how supportive our friends, family, and coworkers have been. Our lifestyle is different, though, and people are curious about it, which puts our lives under a lens from time to time. But knowing that we are content with living on a boat and can still be productive human beings makes us worry less about how others perceive us. And, this is something that we already knew about ourselves, but it’s proved to be more and more true over this past year: we’re happiest when we can be outside. Sailing creates a great avenue for us to explore the outdoors and take advantage of having the San Francisco Bay as our backyard. We’re so much closer to nature now that we live on our boat, and that really puts both of us at peace. I don’t know how long we’ll be living on our boat for, but I do know that this chapter in our lives isn’t over yet. It’s been an incredible, beautiful, and at times trying year, but I wouldn’t change it for the world, and I’m not ready to let go of it yet. We’re Moving onto Our Boat!